Name: Michael Gabriel Booth, Ph.D.
One night, a bunch of us were hanging out at Bailey’s Chocolate Bar. My friend Michael casually mentioned that he thought it would be cool to somehow decorate the inside of his doctoral robe. This was towards the end of June 2008, a couple weeks after graduation at Principia College, where he teaches. Both of us being reasonably creative people, our conversations often turn into explorations of the ridiculous, the preposterous and the impossible. But somewhere in the middle of the evening, the idea captivated my imagination, and I actually started to wonder if such a thing could be done. The first thing was to have a look at this robe. Michael dropped it off at our house before heading up to Alaska for the summer, where he is a Research Associate Scientist at the Institute of Arctic Biology of the University of Alaska, Fairbanks. 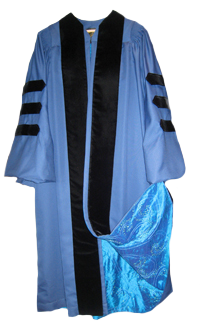 I had never really had a close look at a doctoral robe before, so I wasn’t quite sure about the mechanics of this idea. I’m not really a textile artist or a seamstress, so I wasn’t quite sure about how to fit any sort of lining inside the robe. I learned embroidery in Girl Scouts, though, so I could imagine how to make designs on the fabric. Once I had examined Michael’s robe, I saw that the seam up the spine would make it pretty easy to line. For some reason I imagined there would be two side seams, and that sounded much more complicated. 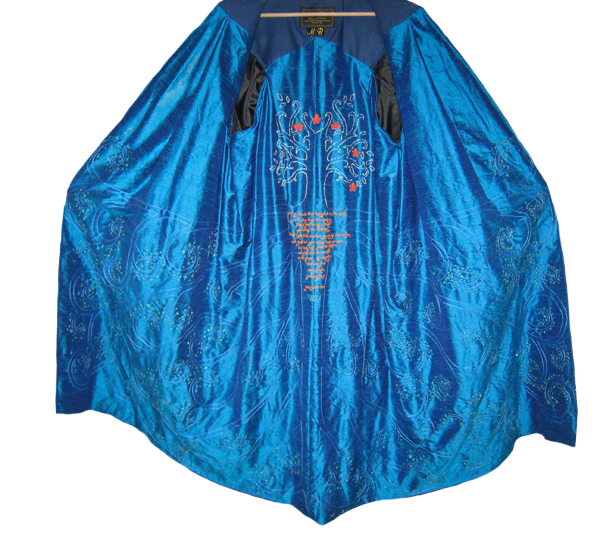 Instead, the main body of the robe is essentially made up of two lengths of polyester fabric right off the bolt. The lengths are sewn up the back along the spine, and gathered across the shoulders in the back. In the front, there is a large pleat right behind each vertical black velvet panel. The next thing was to choose the fabric for the robe lining. I took the robe with me and headed over to Jackman’s Fabrics (1234 North Lindbergh, 63132) just to see what they had. Of course, I was immediately drawn to the silk section. There was a whole wall of gorgeous dupioni silk in every color imaginable. After testing a couple of colors against the blue of the robe, I finally settled on a delicious shiny blue-purple that reminds me of a morpho butterfly wing. The nice lady at the fabric store helped me measure out the fabric, while looking at me quizzically the entire time. (I frequently have trouble explaining my hare-brained schemes when purchasing supplies. Oh well.) As soon as I got the fabric home, I cut the 3 yards of silk into two 1.5 yard segments and then sewed the two pieces together to make the spine seam. That made a 54″ tall by 88″ wide rectangle. 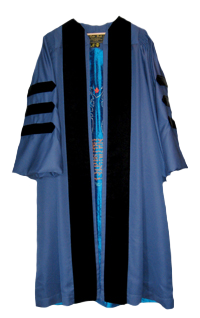 As I pondered how to illuminate the inside of Michael’s doctoral robe, Gabriel (my husband, and the designer of this website) came up with the idea of embroidering an extensive labyrinth of tree roots over the majority of fabric, with little stars to represent the mycorrhizae which Michael studied for his Ph.D. I loved this idea. It made perfect sense for the embelishments on the inside of the robe to somehow illustrate its owner’s field of study. (Particularly since Ph.D.s often get pretty wrapped up in their work. Ha ha.) 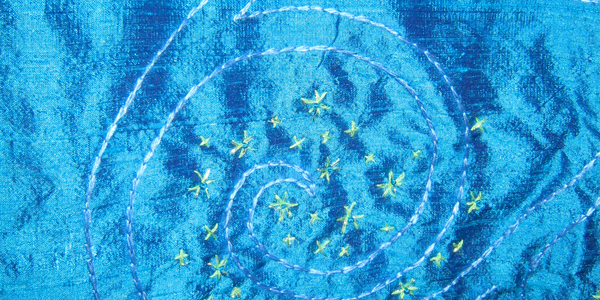 First, I drew the design onto the fabric with blue chalk, and then used a lighter blue silk thread to sew the roots. 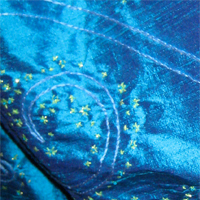 I used an acid green wool and silver thread twisted together for the fabulous fungus stars, and made knots in the center of the stars out of the teal weft from the main silk background fabric. Above, you can see a close up of the swirling root pattern. As I was sewing the roots, I started thinking that all these fancy roots needed to connect to some kind of plant. There was about 12 square inches of space in the center of the back where some kind of tree could grow. Now at the same time I was working on this project, I was also illustrating the 10 Commandments as a board book for the Christian Science Publishing Society. When I needed a break from painting, I would pick up the luxurious fabric and dive into the simple rhythm of the running stitch. I especially loved sewing outside in the natural light, because the silk seemed like jewelry or a slice of the Caribbean Ocean in my hands. I also watched a lot of movies while painting. About the same time I was wondering what sort of tree to sew above the roots, I rewatched the entire Lord of the Rings series. I couldn’t help noticing how much the style of my roots resembled that of the White Tree of Gondor emblazoned on the flags and armor in the movie. I knew Michael had read J.R.R. 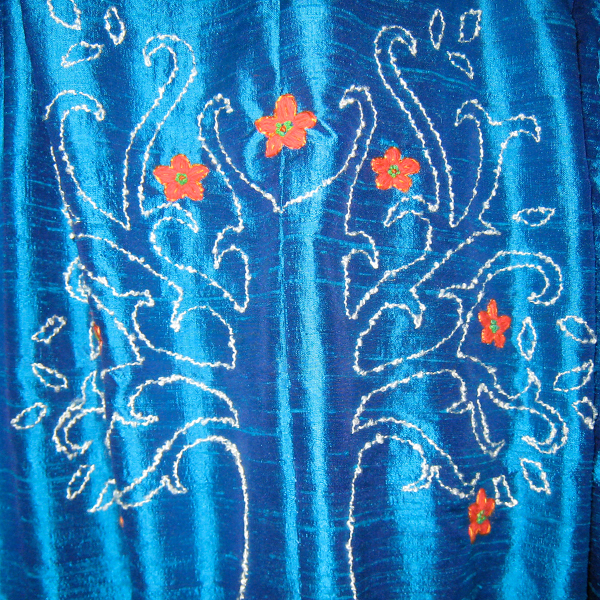 Tolkien’s Lord of the Rings trilogy several times, so the tree on his robe is based on that design. It came out looking more like the White Shrub of Gondor, however, because I didn’t have enough room to make a tall trunk. There are seven red flowers in the crown of the tree. (A fold in the fabric obscures two blooms on the left in the above picture.) I used a textured white and silver thread for the tree, and red and orange wool and silk thread for the flowers. The white thread was pretty bulky, so I had to use a much larger needle. Of course there is the obvious mention of the roots and the tree, but I also liked how it mentions the river, since Principia College (where Michael currently teaches as of 2008) is located on the bluffs overlooking the Mississippi River. I loved the idea of going beyond endurance to actually flourishing in fierce weather, followed by the promise of perpetual productivity. To tie in with the White Shrub of Gondor, I set the text in a font called Bilbo Hand, which I downloaded for free. I then printed out the quote, and pinned the paper onto the fabric in the right place. Then I sewed right over the letters and through the paper. When I was done, I picked away the paper to reveal the finished inscription. A bit time-consuming, but it works. It’s kind of fun to realize that except for the ink jet printer, I was making excellent use of 14th century technology. 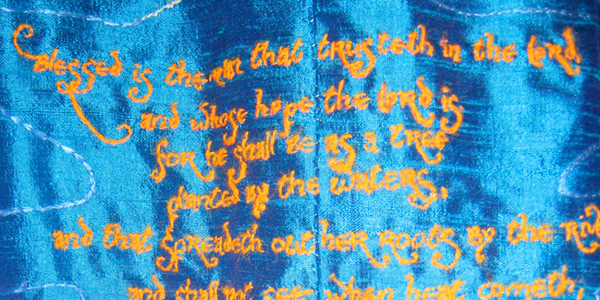 The close up photo below shows some of the lettering, which I sewed on in light orange wool thread. It really pops against the shimmery blue background. I began sewing the roots in the last week of June 2008, and finished the whole project on 1 August 2008. I brought this project with me everywhere – in the car on trips with Gabriel across town, on trips to visit family in Orinda, California and Petoskey, Michigan. Having not done a sewing project in a good long while, I forgot how relaxing handwork can be. My imagination wandered through the realms of upcoming book projects, paintings in progress, and my sister’s wedding, which is only a month away (30 August 2008). The only drawback about making use of moments in public places is that I felt like I needed a 15 minute Power Point presentation to explain the project every time someone asked what the heck I was doing, which they inevitably did, since no one could take their eyes off this gorgeous silk that looked like a gargantuan butterfly in my lap. When it finally came to sewing the lining into the robe, I was a little nervous. Doctoral robes are not cheap, so I didn’t want to mess it up. First I lined up the spine seam, and then pinned the bottom hem. Then I carefully folded the lining and matched it up with the vertical front hems, where a zipper would be if this robe had one. Once I had the big flat edges pinned in place, Gabriel rigged a thick electric wire through a metal brace in dining room the pocket door, so I could hang the robe and turn it around as needed. It was almost as good as having it on a mannequin. Much easier to work with such a voluminous amount of fabric when it hangs straight while I am sewing it together. I began with the top of the back, right under the monogram. I sewed down to each arm hole, and then carefully cut away the extra silk. I made one box pleat at the bottom of each arm hole, and then rounded the corner to the front of the robe, where it was easy to match the lining up with the giant pleats behind the vertical velvet bars. Next I hemmed down the front of each side, and finally around the bottom. 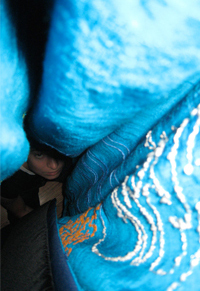 This picture shows me sitting on the floor looking up through the folds of the robe as I worked on the bottom hem. 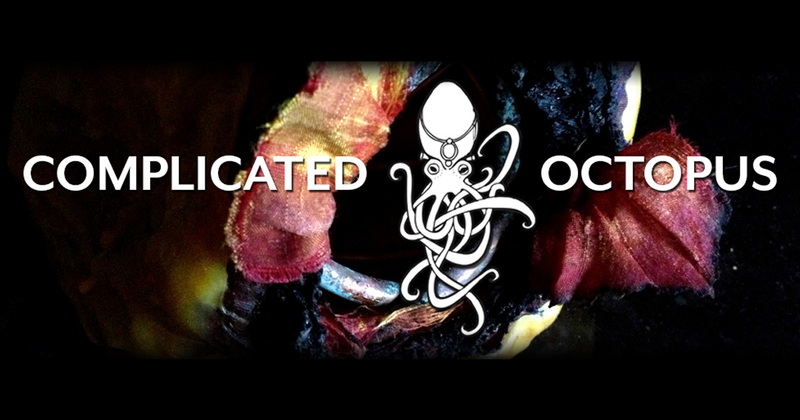 At last, here is a look at the completed project.